Successfully Added Component to VGA Convertor for Consoles to your Shopping Cart. Sick of a grainy low resolution picture from your old standard definition TV when playing games on your X Box 360, PS3 or Wii? Why not use a computer monitor to display all the latest games in their true splendor? With this awesome little conversion box you can do just that. Setup of this unit couldn't be simpler, simply plug your component video inputs and audio inputs in from your console, plug the supplied VGA cable in to your computer monitor and a 3.5mm audio cable to your PC speakers and your ready for some cool HD gaming. 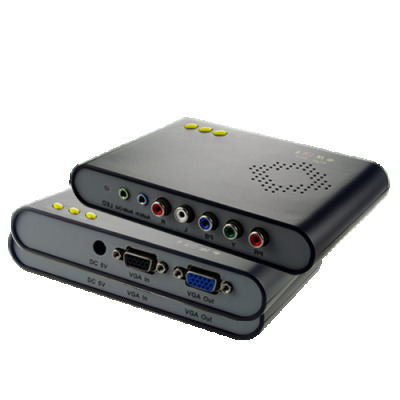 Compatible with all consoles with a component video output including Playstation 3, Playstation 2, XBox 360, Xbox and Nintendo Wii. The unit also includes a VGA and audio pass through so you can still easily use the monitor with your PC when you're not gaming. Another great gaming accessory brought to you by Chinavasion at awesome wholesale prices, buy direct from China today. Please ensure your monitor is capable of displaying your desired resolution at the refresh rate (KHz) listed in the specifications of this product.